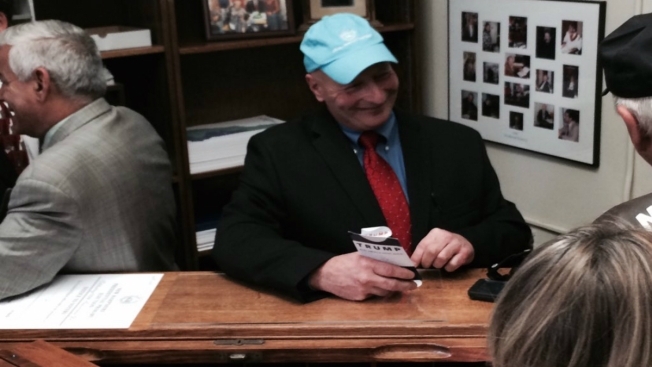 A Donald Trump supporter tries to scrape off a Trump sticker that he inadvertently stuck to a 100-year-old desk in the New Hampshire Secretary of State's Office on Wednesday. It was a moment of panic. On Wednesday morning, as a host of media waited for Republican presidential candidate Donald Trump to arrive to file for the New Hampshire Primary, one of Trump's supporters accidentally stuck a "Trump for President" campaign sticker on a historic desk in the New Hampshire Secretary of State's Office. Republican John Hikel, a former state representative, quickly realized his mistake and attempted to scrape the sticker off, to no avail. Unfortunately for him, the desk the sticker had been affixed to was a historic relic dating back to the early 1900s. The desk belonged to former state Rep. Stephen Bullock, who proposed the bill creating the New Hampshire Primary back in 1913. It was given to the Secretary of State's Office earlier this year so that candidates signing up to run in the primary could do so on the historic piece of furniture. Luckily, the Trump sticker had been affixed to a piece of glass on top of the desk, and not the wooden desk itself. It was apparently removed once the media horde cleared with the help of a little bit of Yankee ingenuity using some peanut butter.